Spain's public TV has broadcast a live bullfight for the first time in six years after conservative PM Mariano Rajoy lifted a ban on the tradition. The fight in the northern city of Valladolid screened on Television Espanola (TVE) on Wednesday evening. The previous socialist government cut live transmissions as they were costly and aired in children's viewing time. Anti-bullfighting sentiment has been on the rise, with Catalonia outlawing the practice in January. Lawmakers in the autonomous region voted for the ban last year - the first in mainland Spain - after 180,000 people signed a petition. But the corrida, as it is known, is still permitted in all other regions of Spain except in the Canary Islands, which banned it in 1991. Pro-bullfighting supporters, who include Mr Rajoy, say the tradition is an art form deep rooted in Spanish history. It dates back at least 4,000 years and is thought to have been popularised by the Romans. For those who never have watched a bullfight on TV, and might never want to, the coverage is in some ways similar to the way any TV channel would cover a football match. In the crowd, there were people of different ages, including elegantly-dressed young women. However the vast majority of tonight's audience would vote for Spain's ruling centre-right, and crucially the pro-bullfighting Popular Party. The party's election last December, and the subsequent, more recent change of management at Spain's public broadcaster paved the way for the return of bullfighting to TVE. For those cheering in the stadium, waving their white scarves in approval after the first kill, it is a risk-ridden sport and the ultimate act of bravado. For others in Spain and abroad it is simply cruel. TVE's decision to air a short series of fights in the coming months, at the traditional time of 6pm, is seen as a big victory for fans of the bloodsport. "The potential audience that might be attracted to this line-up is, in itself, a sufficient reason for broadcasting it," a spokesman for the station said. Many in Mr Rajoy's centre-right People's Party will be pleased about the news, says the BBC's Tom Burridge in Madrid. 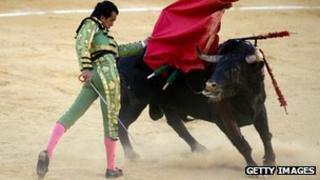 The party supports bullfighting and has opposed previous calls to ban the sport. When the party swept to power in December, it approved a new management team for Spain's national broadcaster, our correspondent said. This in turn has paved the way for bullfighting to make a comeback to public TV. However opponents argue the practice is barbaric, with the odds heavily stacked against the animals, which suffer unnecessary torment. Campaigners hope to extend the ban across the country, but they face a tough task in traditional bullfighting heartlands like Andalucia and Madrid.